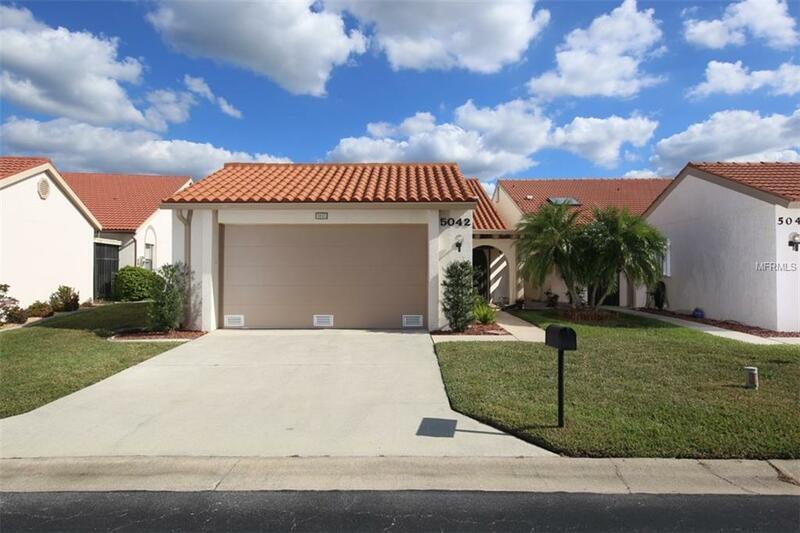 Desirable two bedroom plus den villa is nestled away on a private culdesac that backs up to a arm of Alligator Creek. You will love the setting of this well maintained villa that offers a natural backdrop of a private island and an oversized side yard. Store your kayaks in the garage to launch at the community dock down the street, and explore the natural wonders of the creek and Charlotte Harbor. You will approach the attractive front entry door from the covered front portico, which connects the 2 car garage (with new 180 mph door and opener) with the main living area. Inside you will love the open plan with soaring ceilings brimming with fabulous natural light from the skylights and windows and sliding glass doors. You will also find attractive oversized tile throughout this comfortable split floorplan. The tremendous kitchen offers abundant cabinetry and work surface for those who love to cook. You can easily add an island or seating area, or even more cabinetry. The pantry closet can also serve as a utility closet, with hook ups for washer & dryer. Mix up a refreshment at the wet bar before stepping out to you own private solar heated saltwater pool w/new pump motor. There is ample under cover space on the lanai for dining alfresco. Enjoy the two tankless water heaters, water softener & R/O under sink. Full shutter protection makes travel a snap. Very conveniently located in close proximity to town and highways....you can even ride your bike to the grocery store and Home Depot!!! Additional Lease Restrictions Must Receive Approval From Homeowners Association. Pet Restrictions See Hoa Docs For All Pet Restrictions.